It’s known that SSD have limited amount of read / writes similar to USB memory sticks. Drives usually come over provisioned so there are plenty of spare space to replace the bad sectors but it’s inevitable it will need replacing like most things. 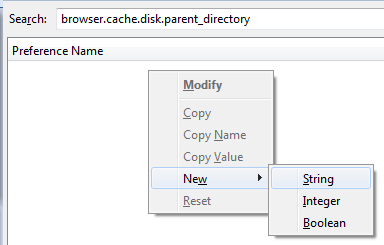 One thing to reduce the amount of read / write is to move the cache to a RAM Disk. Go here to see how to create a RAM Disk. The idea is the cache is written to RAM rather than the SSD since cache can change frequently depending on the sites you visit. As with most things there is a compromise. RAM Disk is less reliable compared to disk. If an unexpected issue such as power loss were to occur, the files stored on the RAM Disk may not have been written to disk since there is a delay. With browser cache this should not cause too much problems other than web site assets having to be reloaded again. If not entry appears then it needs to be created. Right click anywhere in the white space > New > String. Restart Firefox (close and reopen) for the changes to take affect. After the restart, files should appear in the folder which will confirm the setting has worked. The technique above should greatly reduce the the amount of read/write to a drive. You can check how often this happens by looking at the last modified date on the files. I.T software professional always studying and applying the knowledge gained and one way of doing this is to blog. Danny also has participates in a part time project called Energy@Home [http://code.google.com/p/energyathome/] for monitoring energy usage on a premise. Dedicated to I.T since studying pure Information Technology since the age of 16, Danny Tsang working in the field that he has aimed for since leaving school. View all posts by Danny →	This entry was posted in Web Browser, Windows and tagged Cache, Firefox, Mozilla, Page cache, RAM Disk, solid state drive. Bookmark the permalink.